I admit that I've started to pay a Lot of attention to the CDs that are being pushed at Starbucks/Hear Music. There are some people in that loop with pretty dang big ears and a keen sense of timing. Usually I just pick it up and check it out, but the woman on the front of this CD was so beautiful (only human) that I remembered to check out the music on iTunes when I was at home later. I was even more knocked by what I heard. 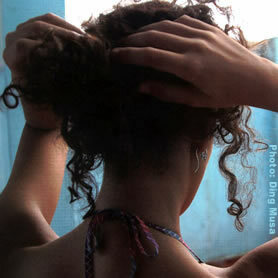 CéU's full name is Maria do Céu Whitaker Poças. Her dad is a musician and musicologist who instilled in his daughter a sense of tradition and discipline. They are paulistanos, residents of the chaotic and diverse metropolis of São Paulo, home to a thriving musical underground of many skeins. When CéU talks about the scene, it makes you want to go, it certainly compels this writer to go someday soon. 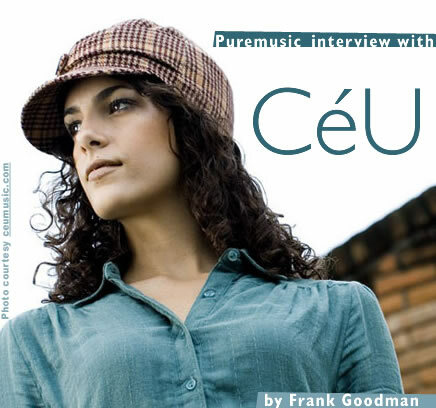 Get on to CéU now, she's taking off. She was nominated for a Latin Grammy in 2006, and is the fourth artist and the first international artist in the Starbucks Hear Music ™ Debut series. She was so winning on the phone from L.A., so sweet and so full of life and where it was going. She's what's on the turntable, so to speak, in my house, and that's how it's going to be for a while.... Get knocked out and check out the clips on the Listen page. She's on tour with her small group at the moment, opening as a trio for the acclaimed Rodrigo y Gabriela, from Mexico. She'll be back in the fall with her sextet. Our new favorite.